Is It a Black Tea, a Green Tea, or an Oolong? 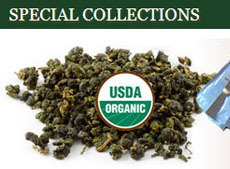 The difference between a black tea, a green tea, and an oolong can be difficult to tell sometimes. This article will focus on the difference that is due not to cultivars but to the level of oxidation. As in how much (expressed in percent) the leaves have been allowed to oxidize (often mislabeled as fermentation, a totally different chemical process as we wrote about here and here on this blog). Most tea sites will describe green teas as “un-oxidized” (actually, they can be oxidized to about 5% just getting from the field to the factory), black teas as “fully oxidized” (more correctly 95-100%), and oolongs as “partially oxidized.” But that’s not very exact, so a closer look is warranted here. 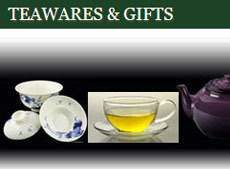 I need to mention Darjeeling teas here as sort of a side note. Many of them get classified as black teas although the tea leaves are not black. That is basically due to the classification being based on the amount of oxidation the leaves have undergone during processing but also a historical matter. 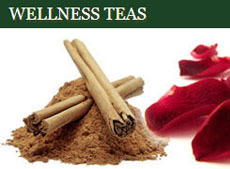 Some experts consider them more like oolongs in terms of oxidation levels. One source says there is a difference in oxidation levels between oolongs from China and those from it’s sister nation Taiwan: Chinese oolongs range from 10% to 20% oxidation only – very light; Taiwanese oolongs are oxidized to 70%, producing stronger flavors. 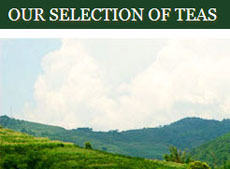 How credible this is can be doubtful, considering that Tieguanyin, a Chinese oolong, is usually oxidized more than 20%. But the real issue is when does a tea oxidize enough to be an oolong, and that seems to be above 5%, and when to be called a black tea and that seems to be above 90% (some sources say 95% minimum oxidation). Oolongs are roasted (baked) to stop oxidation, further dry the leaves, and shape them. They can undergo several roastings, depending on the tea being created. This will also darken the leaves. So again I say not to go by the color of the leaves. 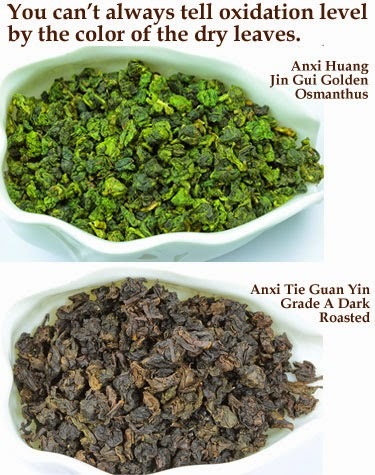 These Dancong oolongs shown at right vary in color, as do the Anxi oolongs shown above, due at least in part to the roasting. This entry was posted in Oolong Teas, Taiwan Teas, Tea Info for Newbies and Up and tagged chinese tea, JAS-eTea, Oolong Teas, oxidation, Taiwan Teas. Bookmark the permalink.